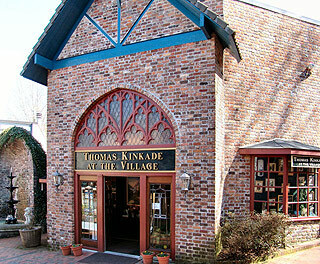 Practically a work of art by itself, this gallery can be found in the nostalgic Village section of Gatlinburg. 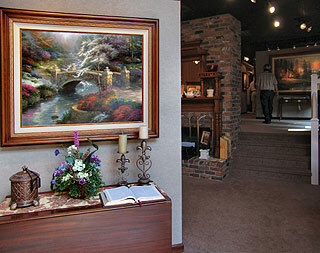 Standing at an impressive two stories and featuring nearly 120 framed canvases, it is one of our most popular galleries. With brick lined streets and many shops to explore, the Village is a perfect place to spend time on your visit to the Great Smoky Mountains. 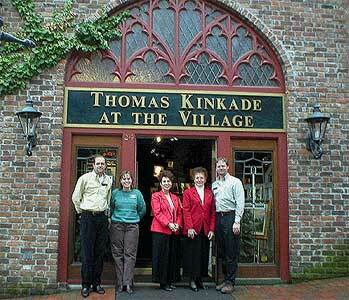 As our flagship gallery, it carries our largest selection of Thomas Kinkade limited edition prints as well as collectibles and stationary. From Atlanta, GA: Go through Cherokee, N.C., take 441 North through the mountains to downtown Gatlinburg. turn right at traffic light 6. will see entrance to Village on right. We are located on the left after you enter the Village. There is a parking lot here for your convenience, on the right. From Townsend, TN: Take Wears Valley Road toward Pigeon Forge, come to Pigeon Forge, turn right onto 441 South towards Gatlinburg. After entering Gatlinburg, turn left at trafficlight #6, Village is located on right, we are located on the left after you enter the Village. There is a parking lot here for your convenience, on the right. From Johnson City, TN: Take 321 South straight too downtown Gatlinburg, turn left at traffic light #6, Village entrance is located on right. We are located on the left after after you enter the Village. There is a parking lot here for you convenience, on the right. From Interstate 40 West: Take Dollywood/Pigeon Forge exit - turn south (Route 66), turns into #441 south, stay on this through Sevierville, Pigeon Forge, and into downtown Gatlinburg, Turn left at traffic light #6, Village entrance is on right. After entering the Village we are located on the left. There is a parking lot here for your convenience on the right.